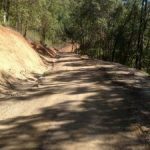 The Goat Track Upgrade – Mount Nebo Residents’ Association Inc. 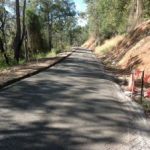 The below updates and photographs were provided by staff from Moreton Bay Regional Council to residents of Mount Nebo and Mount Glorious throughout the Goat Track Upgrade. 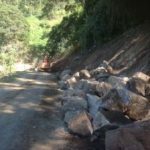 Road users are reminded to take extra care at the intersection of the Goat Track and Mt. 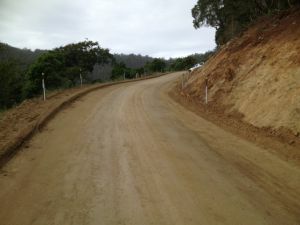 Nebo Road and at the intersection of the Goat Track and Mt. Glorious Road. 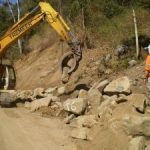 As the road reconstruction work progresses, there will be an increase in the number of trucks and construction vehicles that will be passing through these intersections. These intersections will be well signed, however the roads do corner at these locations and the construction vehicles will be moving slowly through the intersections. 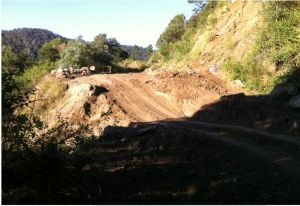 Once the contractor is on site, the section of the Goat Track that is to be reconstructed becomes a construction site. 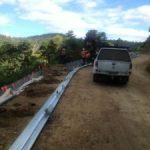 This section of roadway will be fenced off and security put in place to protect the construction plant, equipment, facilities etc. Public access through the construction site will be prohibited for safety and security reasons. 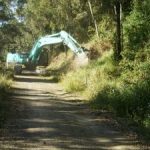 Next week, activities will centre around survey work and preparation for controlled clearing of vegetation from work areas. 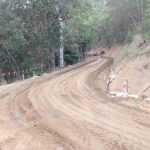 It is anticipated that a construction site area will also be established at Mt Nebo Road end of the Goat Track within the next few weeks, as works will be conducted from both ends concurrently. 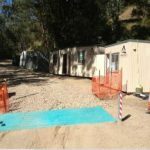 Completing the set-up of the site offices at the Mt. 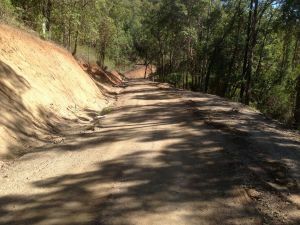 Glorious end of the Goat Track – refer to photo. Completion of site survey control. 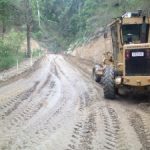 This is used by the Contractor to set out the road and ensure that it is reconstructed as per design. 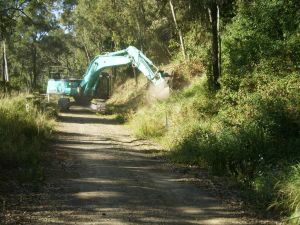 Clearing of the vegetation from the work areas – refer to photo. 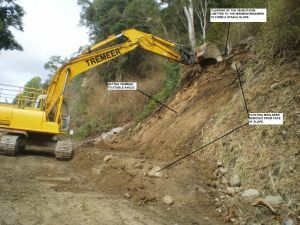 Preliminary earthworks and removal of boulders in order to establish a track through the site for the construction machinery – refer to photo. Continue with site clearing. 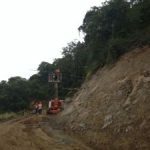 Once the thick vegetation is removed from the work area, Geotechnical Engineers will be regularly inspecting the site to ensure the adequacy of the design and construction. 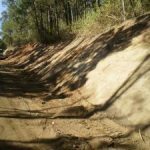 Start the “dry wall remediation treatment” of the downhill slopes. 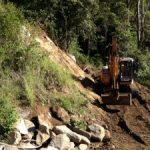 This involves stabilising the downhill slopes with a sloping rock berm. 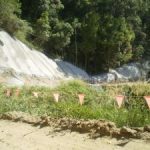 There will be several types of slope stabilisation treatments used throughout the project. 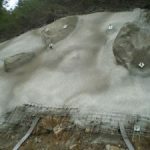 The dry wall treatment will be used on the downhill slopes where the angle is not very steep. 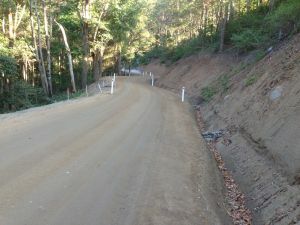 The bulk of the clearing of the work area is now completed. 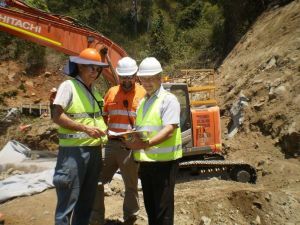 Geotechnical Engineers and Ecologists from the design team inspected the project site. 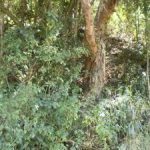 We have identified, tag and mapped all the Macadamia Integrifolia which are trees classified as Threatened Species. 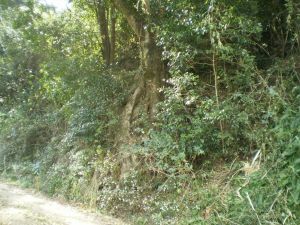 There are several of these trees along the proposed path for the road reconstruction work. The design team is currently reviewing and modifying the design in order to preserve the “Macs”. Refer to attached photo – the Macs are in the background of the photo. 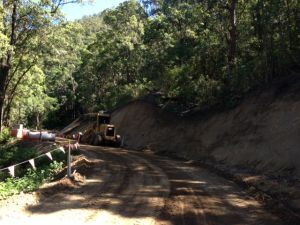 The construction of the first of the “dry wall” slope stabilisation treatments along the Goat Track is well underway. 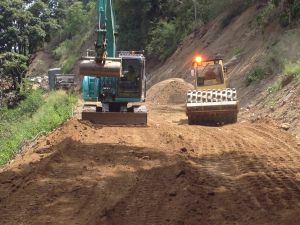 The contractor has also started with the site preparation for the next two similar structures further along the Track. Refer to photos. 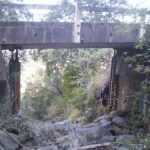 Structural engineers also inspected the bridge structure in the middle of the site. 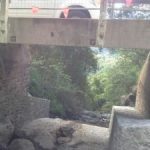 The engineers have forwarded to the contractor details of the temporary support structure necessary to enable the construction machinery to safely travel over the bridge. 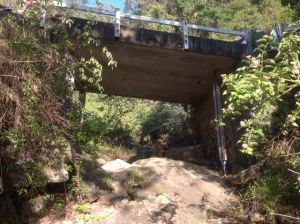 Following minor repairs being completed, the existing bridge will be part of the reconstructed Goat Track. Refer to attached photo. 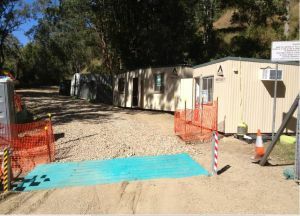 Enabling the construction vehicles to access the site from both ends of the Goat Track. 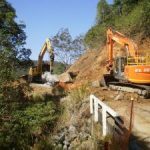 The dry wall treatment work will then be undertaken from both ends of the project, progressing towards the middle of the site. 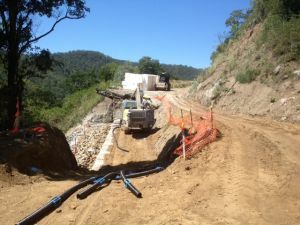 Trucks delivering the 300mm minus stones, used in the dry wall treatment, will then be entering the site from Mt. 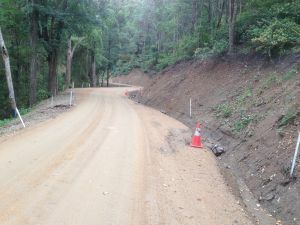 Nebo Road as well as using the current entrance from Mt. Glorious Road. 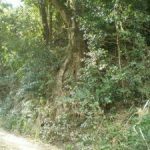 The Doll Tree will be preserved (refer attached photo). 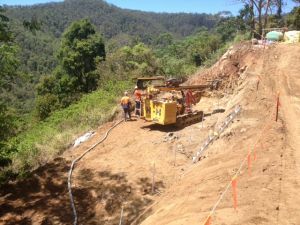 The engineers are currently redesigning this section of the Goat Track to realign the roadway and will construct an embankment system to protect the base of the tree. 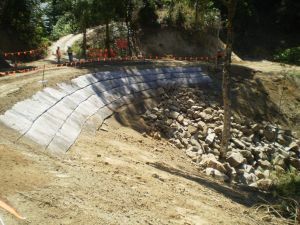 Construction of the dry wall treatment along the downhill slope of the reconstructed road. 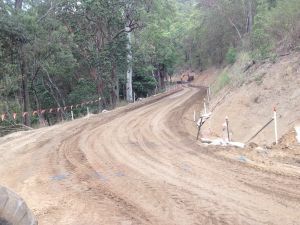 There are now 4 locations along the Goat Track at which the dry wall treatment is currently being undertaken. There will be many locations throughout the project where this type of treatment will be required. 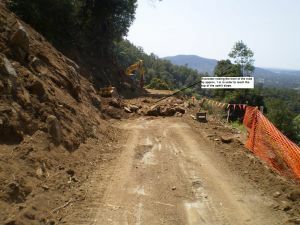 The 3 attached photos shows the construction sequence. 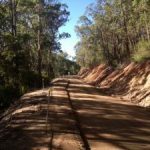 There are several sections of rocky outcrops along the track. For example the rock in the attached photo is too large to be physically removed. To break up the rock the construction team will drill holes into the large rock and fill the holes with an expanding chemical grout. 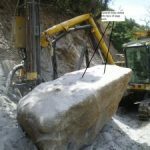 As the grout hardens over the following 12 hours it, expands and splits the rock into small segments which can be removed using a large excavator. Dust is always an issue on projects such as this one. To overcome any concerns, the full length of the project is sprayed 4 times a day with recycled water. Refer attached photo. 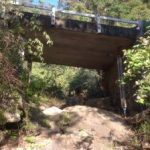 The existing bridge structure has been temporarily strengthened to ensure that the construction vehicles can safely travel over it. Continuing with the construction of the dry wall treatments. Complete the survey that is required at this stage of the project. The project is now approx. 9% completed. 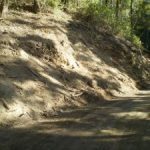 Removal of vegetation from the upslope areas adjacent to the Goat Track was completed a couple of weeks ago. 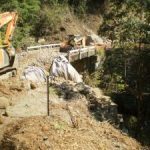 Now the construction team is working to stabilise the upslope embankments. 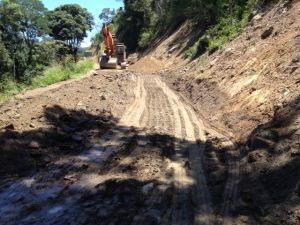 Areas where the slope is only a couple of metres high are being trimmed by the excavator, following which engineers inspect the slope to ensure stability. 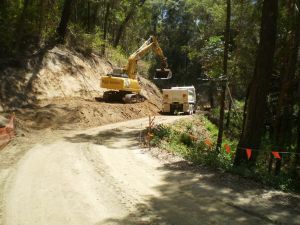 Attached is a series of photos showing the stages in trimming the smaller slopes. Quality Assurance is an important aspect of the project. 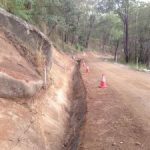 Regular site inspections were conducted this week to ensure the quality of the work – attached photo shows a downslope cutting being inspected. 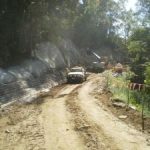 Dry wall treatment continued at two more sites in order to stabilise the downhill slope of the Track. Next week the crew will continue with the dry wall treatments. Also work is due to start to stabilise the Track next to the bridge structure – refer attached photo. The project is now approx.10% completed. Continued trimming of the batter slopes. 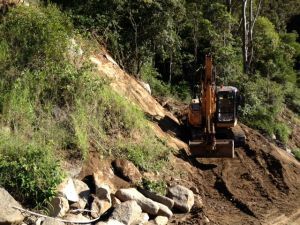 This week the construction crew encountered areas of colluvium material (large stones and boulders surrounded by a soil matrix). 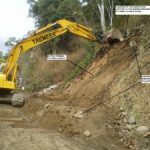 In these areas the excavator has to carefully remove all the floating boulders from the cut-back slope to form a stable surface. 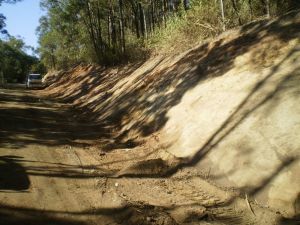 The attached photo shows such an uphill slope. 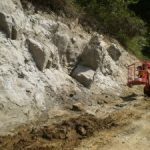 In some situations the practical solution is to leave very large rocks in place and design a wall treatment to ensure their stability. The attached photo shows such a situation. The engineers are currently determining the best treatment method for this particular case. 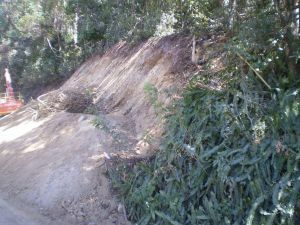 Continuation of cut-back treatment of the uphill slopes adjacent to the Goat Track – as shown in attached photo. 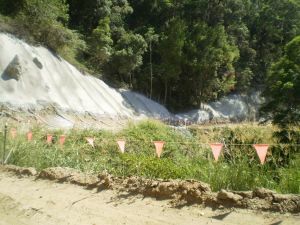 Continuation of the Dry Wall treatment of the downhill slopes adjacent to the Track. 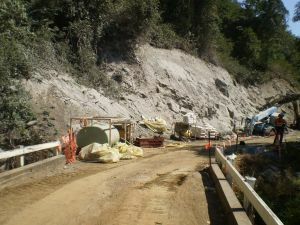 Preparation of the abutment areas at the bridge. The project now is approx. 12% completed. 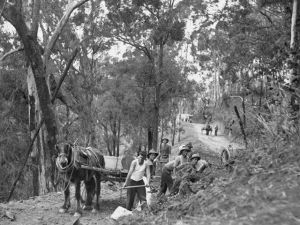 Work continues mainly with the trimming of the uphill slopes. 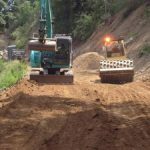 In sections where the uphill slope is quite high (over 5m), the road level is temporarily raised by a meter or so to form a ramp or platform on which to position the excavator. 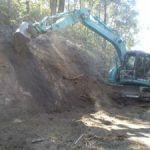 The excavator can then reach and strip back the upper levels of the slope. 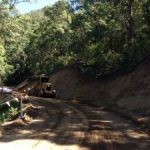 There is a large reinforced soil embankment to be constructed to support the downhill slope at one of the many road bends along the track. 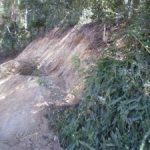 The initial task was to remove the highly weathered material from the downhill embankment slope. 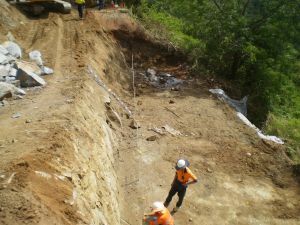 The attached photo shows the slope having been excavated to natural rock foundation level and the crew starting to constructed the reinforced soil embankment. 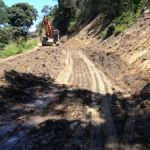 This will bring the slope back up to road level. The construction crew will continue with upslope batter treatment. 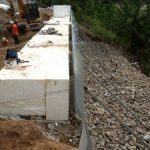 Abutment wall treatment near the bridge will commence. The project is now approx. 15% completed. 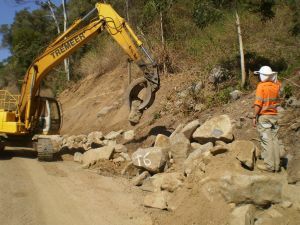 The splitting and removal of boulders from site. 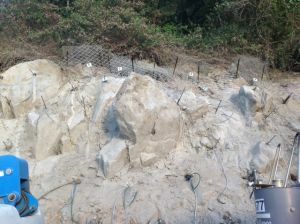 The first photo shows an excavator (in background) filled with a rock hammer breaking up a large boulder into manageable size rocks. 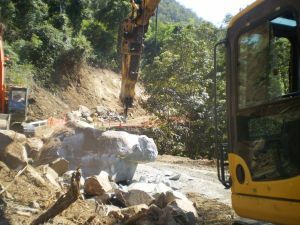 The excavator in the foreground manoeuvres the boulders into position for the rock breaker. 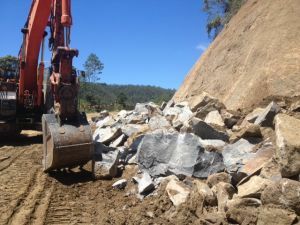 The rock fragments are then loaded onto a truck for transportation off site or reused on site as toe protection on downhill slopes. 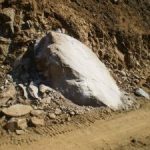 Some boulders are too hard for the rock hammer to break into smaller pieces. 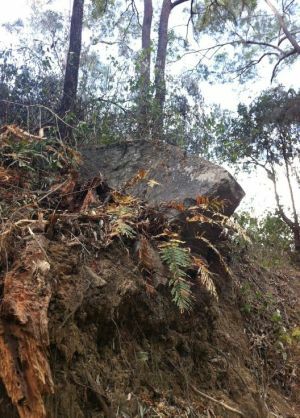 The attached photo shows a boulder which the rock hammer was unable to successfully reduce to rocks of a manageable size. In this case holes will be drilled into the boulder. The holes will be filled with a chemical compound which expands as it hardens and splits the boulder. 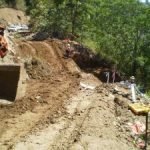 Last week, a photo showed the start of the construction of a reinforced earth retaining wall at a bend in the road (Chainage 180m to 220m – near Mt. Nebo Road intersection). 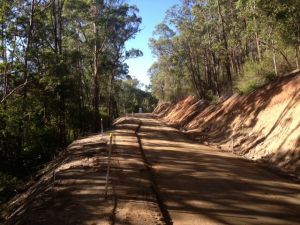 This week’s photo shows the reconstruction of the embankment nearing completion. The reinforced earth is placed in layers and compacted to the design specification. 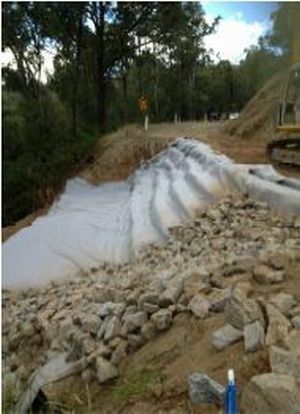 Continue with upslope batter treatment at several sections along the Goat Track. 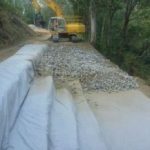 Completion of the reconstruction of the embankment at road-bend (Chainage 180m to 220m). The project is now approx. 17% completed. 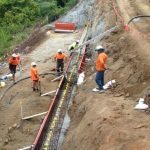 A specialist contractor, for the installation of soil nails and shotcrete, will establish their facilities on site. The project is now approx. 19% completed. 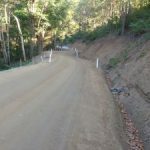 Construction of the large reinforced earth retaining wall has been completed, at the bend in the track at chainage 180m to 220m. 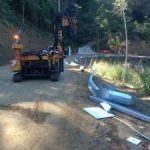 Mobilisation of a specialist contractor, Hyatt Ground Engineering, for the installation of soil nails and shotcrete. 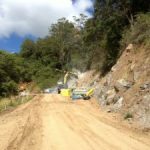 Over the next few months, reference will be make to “soil nails” and “shotcrete walls”. Attached is a description of what these terms mean. 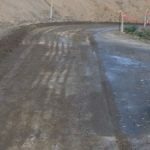 This week the contractor installed “test soil nails”. Next week engineers will witness and record the pull-out test on these soil nails. 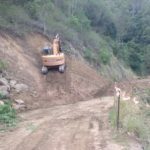 This is done to ensure that the soil nails have been installed deep enough into the hill slope to develop the “pull-out strength” required to anchor the structure in place. While the drilling contractor is drilling the holes for the soil nails, another crew is preparing an earth platform on which the drill rig will be positioned to drill the high level soil nail holds. 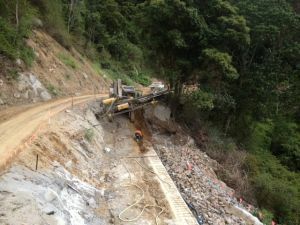 The photo at Ch 880 shows the excavator (in background) making a construction bench in the slope upon which the drilling rig will be positioned. 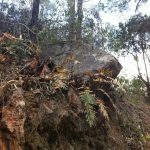 The uphill slope is stabilised only to the extent from which nature can take over. Finalise the pull-out test on the soil nails. The design engineers will use this information to determine the exact depth of the soil nails for each location. 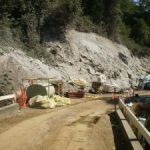 The contractor will then continue to insert the soil nails and construct the shotcrete walls. 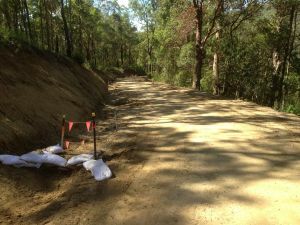 Other crews will continue with other treatments of the upslope batters along the Goat Track. The project is now approx. 21% completed. 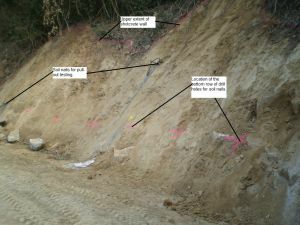 The attached photo shows two soil nails that were installed last week. This week, a jack will be attached to the end of the soil nail. 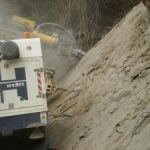 The jack pulls on the nail and the pressure at which the nail starts to be pulled out of the embankment will be recorded. This information will be forwarded to the design engineers to determine the number, depth and separation of the nails. 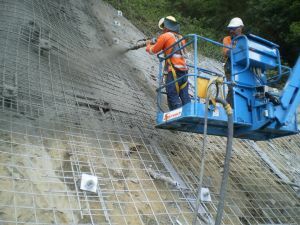 Once all the nails have been installed, a shotcrete wall is sprayed on the prepared surface of the slope to the extent as shown in the photo. 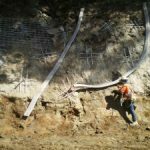 The soil nails are encased in the shotcrete wall to provide stability. The other photo shows the drilling rig drilling the bottom row of holes at the locations marked in the first photo. 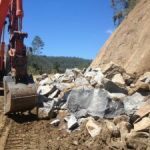 Very large rocks are chemically split into smaller fragments which are then loaded into trucks for cartage off site. 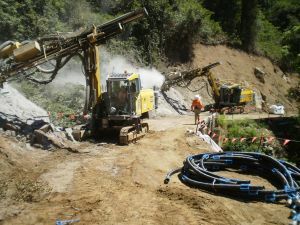 The photo shows a large rock which has had a number of 75mm diameter holes drilled into it by the drilling rig (background). The holes will be filled with grout. As the grout hardens it expands and splits the rock. 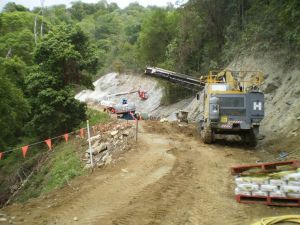 There is also a photo showing an excavator trimming the high slopes from a working platform. 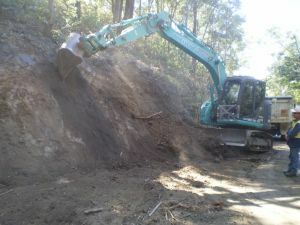 The excavator loads the material trimmed from the slope into a truck for removal from site. 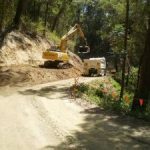 This activity is presently being undertaken at several sites along the Goat Track. 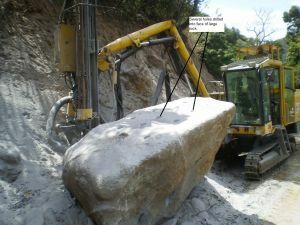 Ch 300 – Holes drilled into large rock for splitting. 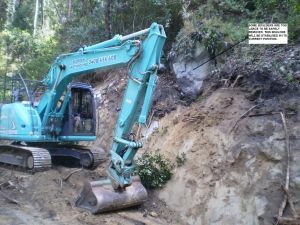 Ch 2200 – Excavator filling truck. 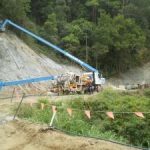 The drill rig that is currently on site has the ability to add and remove extra lengths of drill shaft as required. 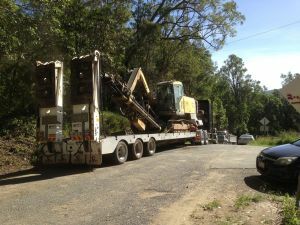 This week another drill rig was brought onto site. On this rig the extra lengths of drill shafts have to be manually added and removed. 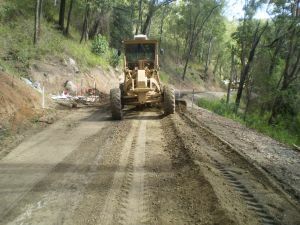 The attached photo shows workman performing this task. 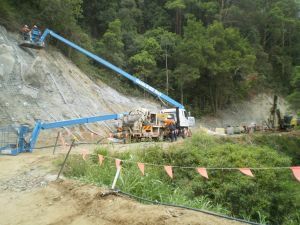 Also attached is a photo showing the equipment used to install the soil nails – the drill rig in the foreground, workman standing on a mobile platform about to insert the PVC corrugated sheath into a 8m deep drilled hole. Once the PVC sheath is positioned in the hole, the workman will then insert a high strength galvanised reinforcing bar into the PVC sheath. Grout is then injected into the hole to form the soil nail. In the background is the mobile work-platform and an air compressor. 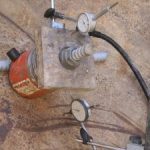 The photo shows a workman recording the pressure that the hydraulic jack is exerting on the soil nail. 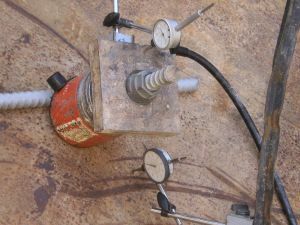 The close-up photo of the jack and the head of the soil nail shows the gauges which measure the pull-out distance of the soil nail at the various pressures being exerted by the jack. 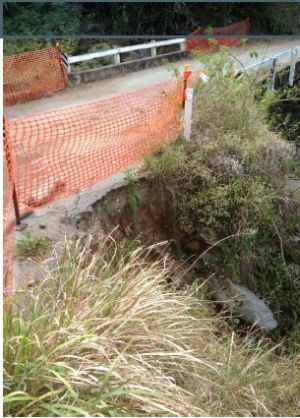 The approach to the bridge was severely eroded. 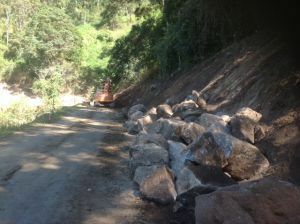 This week the construction crew removed the washout material and replaced it with large armour rocks. 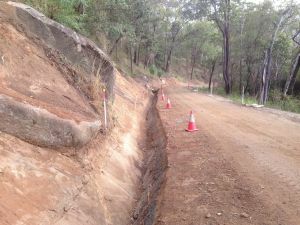 Towards the end of the project, the road pavement will be reconstructed upon the armour rock foundation. 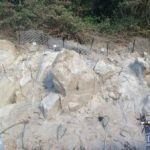 A rock grab continued to remove smaller boulders from the upslope embankment. 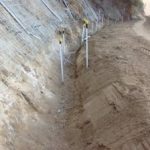 Continue with the installation of the soil nails. 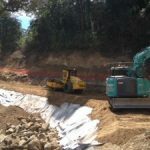 Start the construction of the shotcrete walls on the embankments where the installation of the soil nails has been completed. 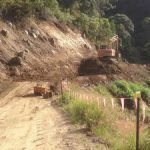 Continue with the cut-back treatment of the upslope batters. 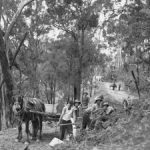 I received an email from John Carter recently in which he provided the attached photo and noted “It was taken in 1931 during construction of the road to Mt Nebo. 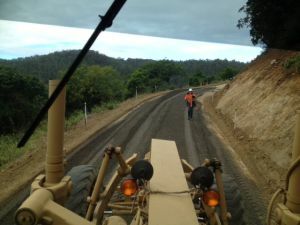 None of those soil nails or excavators etc – just a couple of one horse power carts and workers wearing the hi-vis clothing of the day.” Thanks John for your contribution. The project is approx. 25% completed. 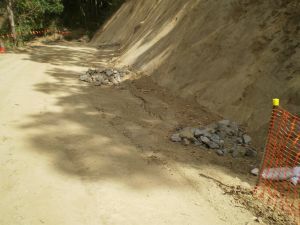 Construction of the armour rock fill embankment has been completed on the uphill side of the bridge. 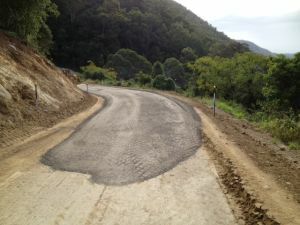 Last week I included a photo showing work at about the half way stage. 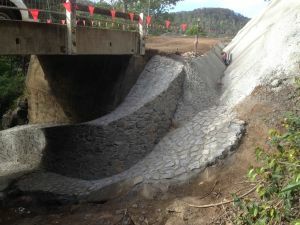 This week the construction crew completed the reconstruction of the embankment – photo attached. 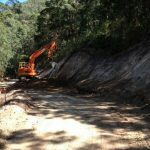 Work is concentrating on the construction of the sections of the road which require the upslope batters to be protected using shotcrete walls held in position with soil nails. Currently there are three drilling rigs on site installing the soil nails. Attached are two photos showing two drilling rigs working on the same upslope batter. 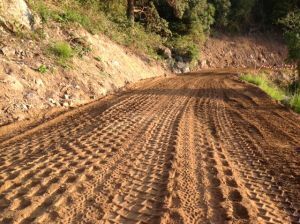 The final photos show the soil nails installed and the batter slope being prepared. 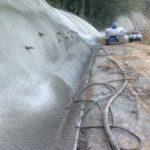 The shotcrete wall will be sprayed against the batter slope with the soil nails cast into the shotcrete wall. 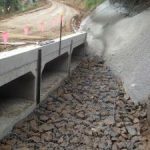 At the base of the shotcrete wall, a stormwater drain is constructed to carry the water downhill to a pipe crossing under the road. 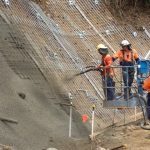 Start the spraying of shotcrete walls on the embankments where the soil nail installation has been completed. 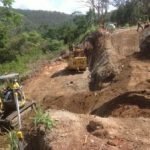 Continue with cutback treatment of the upslope batters. 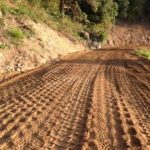 Continue with the rockfill treatment of the downhill batter slopes. The project is approx. 27% completed. 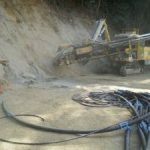 Continuation of the drilling of holes for the soil nails. 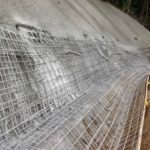 Preparation of the galvanised steel mesh reinforcing for the shotcrete retaining wall. 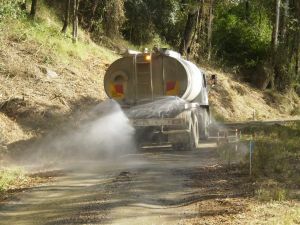 Spraying of the shotcrete to encase the head of the soil nails and to form the retaining wall. 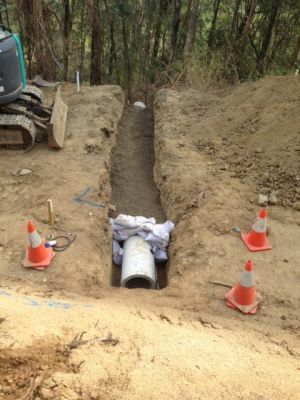 Installation of a new stormwater pipe crossing. 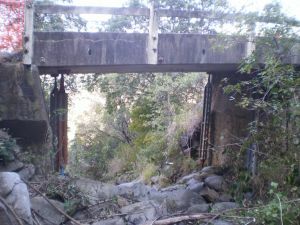 The existing pipe crossings are retained where possible. If the pipes are damaged, they have to be replaced. 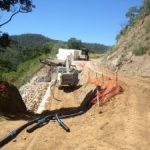 To date 3 pipe crossings have been completed. 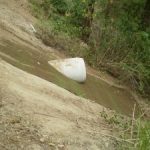 There are 31 stormwater pipe crossings required to be constructed. 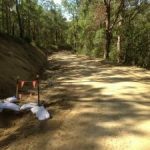 During the week, 59 mm of rain was recorded on site. 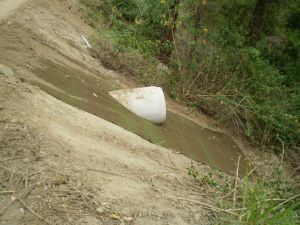 The attached photo shows a series of silt traps along the side of the road used to ensure that the eroded material is captured on site and does not wash into the environment. 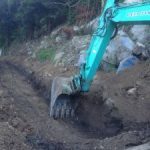 Continue with the installation of soil nails. 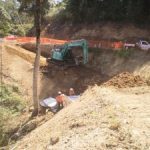 Continue with the installation of the stormwater pipe crossings. 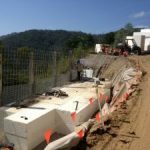 The construction of the Expended Polystyrene Wall (EPS) – details next week. The project is approx. 29% completed. 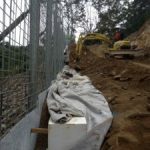 Started on the construction of the Expanded Polystyrene (EPS) retaining wall system at one of the required locations on the steep down-hill slopes. Attached is a description of the EPS wall system and how it is constructed. 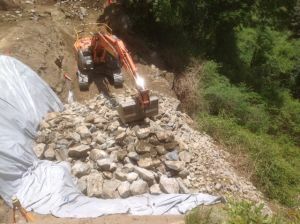 Also attached is a photo showing the removal of the overburden material , the excavation required for the footing of the EPS wall, the steep slope adjacent to the wall and the limited area available in which the construction crew is able to work. 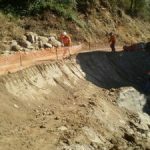 Continuation of the installation of soil nails and the construction of the shotcrete retaining wall. 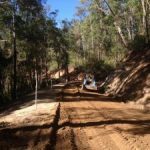 Approx 1,000m of the 7,500m of soil nails have been installed to date on the project (13%). 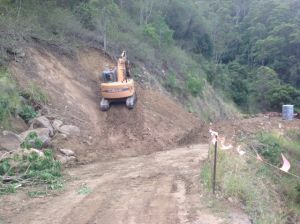 The attached photos show this work being undertaken at 2 sites along the track. 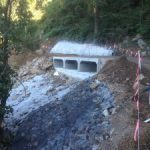 4 of the 31 stormwater crossings have now been installed. 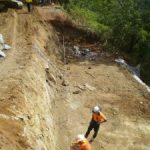 Installation of soil nails and shotcrete wall treatment of the uphill batter slopes. 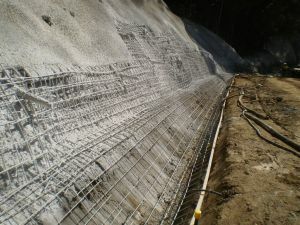 The construction of the EPS wall and the installation of the passive soil nails at its base. The project is approx. 31% completed. 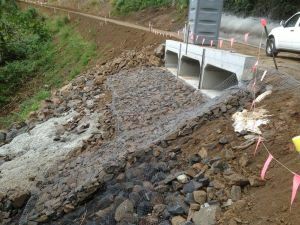 The photo at Ch 760 shows a section of the upslope batter which has large rocks projecting at the surface. 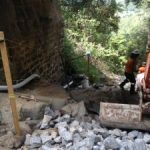 Where this occurs, the rocks are anchored in position using soil nails drilled through them, and then the rock is encased in the shotcrete retaining wall structure. 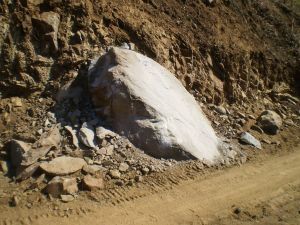 When a floating boulder (a single rock) is uncovered during the trimming of the upslope batters, and the “floater” may cause instability in the slope, the boulder has to be removed. 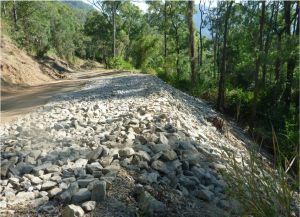 Attached is a photo showing these boulders stockpiled, ready for removal from site. 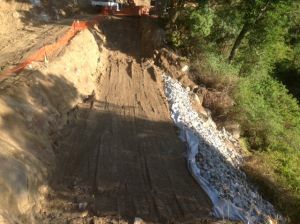 The photo at Ch 1025 shows the excavation for the EPS wall nearing completion. 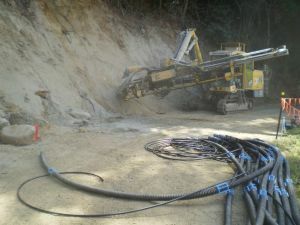 The next photo shows the drill rig positioned in the excavation so that it can drill the holes for the passive anchors. 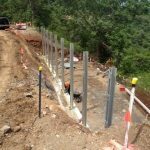 These anchors will secure in position the footings and the vertical retaining wall of the EPS structure. 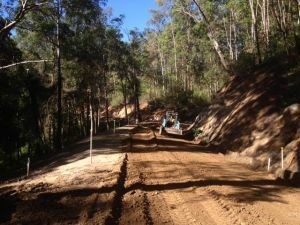 Installation of soil nails continued at two locations along the Track. 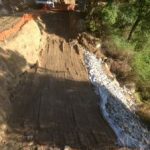 Continued with the removal of any damaged existing stormwater pipes and the installation of stormwater pipe crossings. 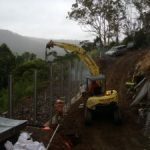 The installation of soil nails and shotcreting of the retaining walls on the upslope batters. 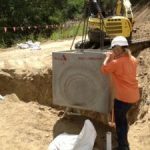 The installation of stormwater pipe crossings. 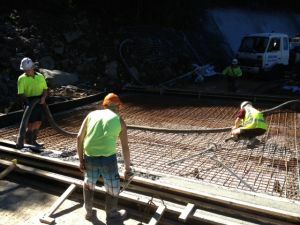 The construction of the EPS wall – installation of the passive soil nails and the fixing of the reinforcing steel in the base of the structure. The project is approx. 33% completed. 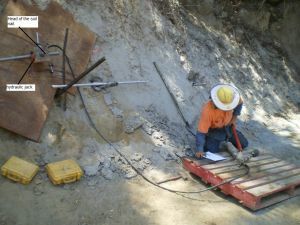 Installation of soil nails at two locations using the three drill rigs. 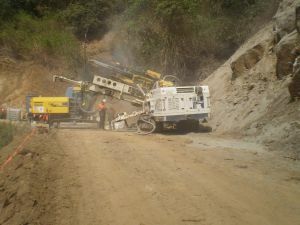 The attached photo shows two drill rigs drilling the holes for the soil nails to stabilise the uphill slope. 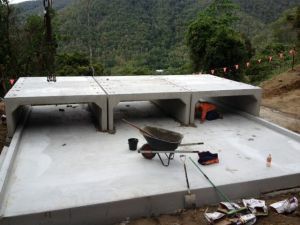 Construction of the two EPS walls – foundations for one of the walls and installing passive anchors for the other wall. 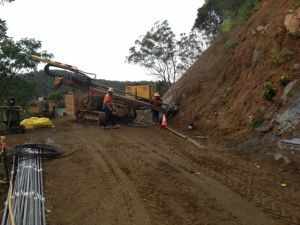 The attached photo shows the construction of the ramp for the drill rig to drive down into the excavation. The rig is then positioned for it to drill the holes for the passive anchors. 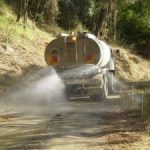 Spraying of shotcrete walls to areas where soil nail installation has been completed. 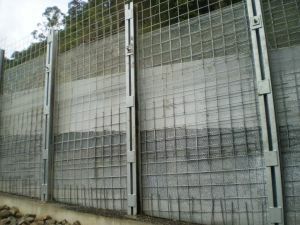 An attached photo shows the wall from Ch 790 prior to the spraying of shotcrete. The project is approx. 35% completed. 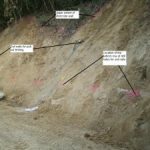 Installation of soil nails at two locations – Ch. 760 to Ch. 790 and Ch. 1080 to Ch.1140. 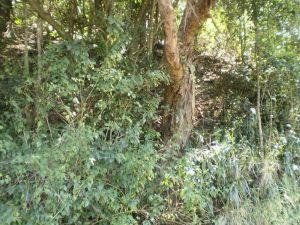 The attached photo shows a rocky outcrop above the Goat Track. 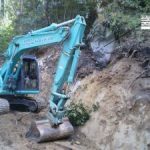 These rocks are too large to remove, therefore they are secured in position by the soil nails. 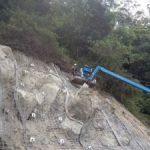 Steel reinforcing mesh will be placed around the rocks and the mesh will be extended to cover the upslope batter surface. 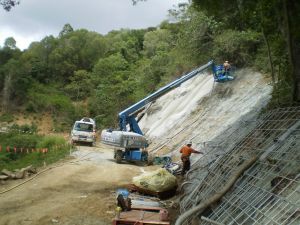 Shotcrete will then be sprayed on the upslope batter to complete the wall structure. 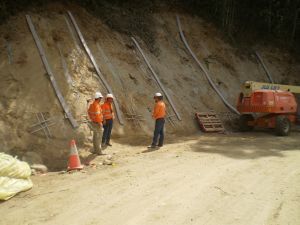 Installation of the passive nails for the Expanded Polystyrene (EPS) wall – Ch. 1025 to Ch.1045. Completed building the dry wall below the EPS wall – Ch. 1235 to Ch. 1260. 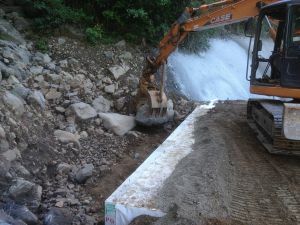 The photo shows the excavator positioning the rocks to form the dry wall. Cut ramp to position the drill rig for the installation of passive nails for the EPS wall at Ch. 1235 to Ch. 1260 and prepared a working platform area. The next photo shows the construction of the dry wall completed, the ramp leading down the excavation to the top of the dry wall and the working platform being constructed on top of the dry wall. 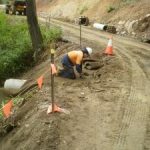 Installation of stormwater pipe crossings. 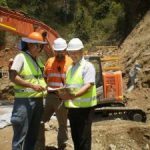 Other photos have been included depicting general site activities. Construction of the EPS wall at Ch. 1235 to Ch. 1260 with the installation of the passive nails at its base. 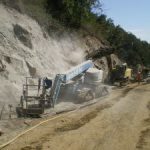 Shotcrete the upslope batter from Ch. 760 to Ch. 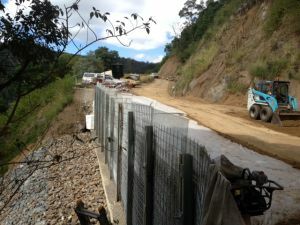 880 once the installation of the soil nails and the fixing of the wall reinforcing has been completed. 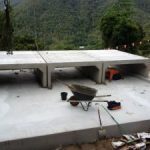 Pour the concrete foundation for the EPS wall – Ch. 1025 to Ch. 1045. 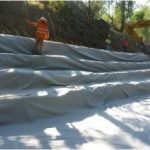 Preparation of the upslope batter from Ch 760 to Ch 800 for the spraying of the shotcrete wall. 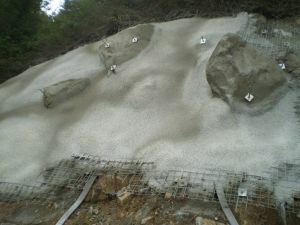 The attached photo show the first section of the wall being sprayed with shotcrete. 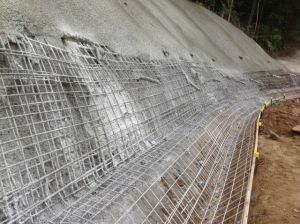 The next photo shows the remaining section of the batter face being prepared with the soil nails, behind wall strip drains and mesh reinforcement in place. 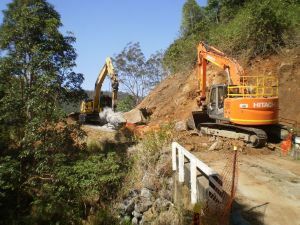 Trimming of the upslope batters with the excavator between Ch 1400 to Ch 1450. 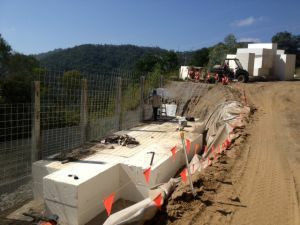 Preparing the foundation for the Expanded Polystyrene Wall (EPS) from Ch 1025 to Ch 1048. 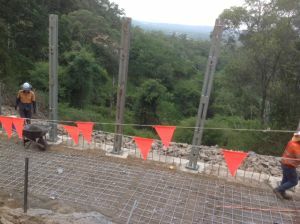 The attached photo shows the strip footing for the EPS wall being poured. 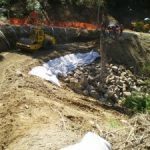 Continued the installation of stormwater pipe crossings and the placement of erosion protection matting at the discharge end of the stormwater pipe. 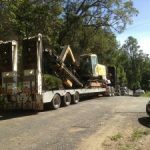 Removal of large construction machinery off site and securing the site for the Christmas/New Year shutdown period. The construction site will be closed for 2 weeks as from Friday (20/12/2013) afternoon for the holiday period. There will be no construction activities on site, however site security measures will be in place. 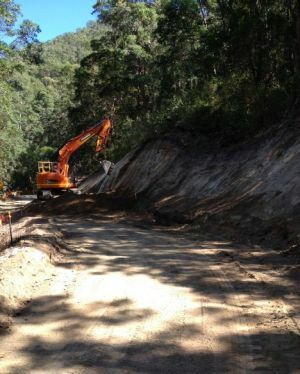 Next project update will be provided week ending 10 January 2014. The project is approx. 39% completed. 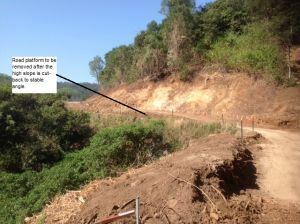 Three of the attached photos show the stabilisation of approx 120 m of uphill slope between Ch 760 to Ch 880. The majority of soil nails have been installed, and workmen are working from an elevated work platform fixing the steel reinforcing mesh. 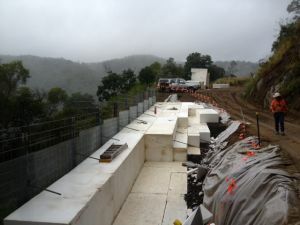 Within the next couple of days, the prepared area will be sprayed to form the shotcrete wall. 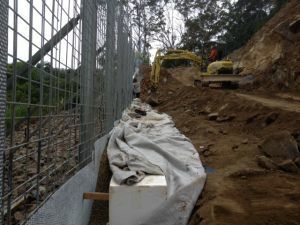 Continued the construction of the Expanded Polystyrene (EPS) walls at two sites along the Goat Track. 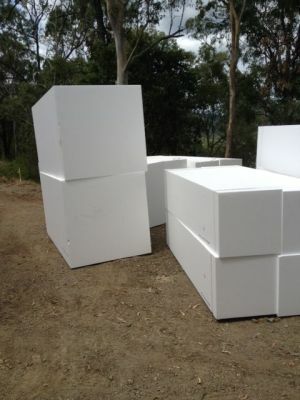 An attached photo shows the EPS blocks being stored onsite prior to use. 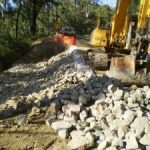 Installation of storm water pipe crossings. 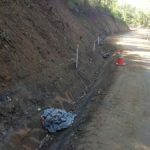 Installation of erosion control matting at the discharge end of the stormwater pipe crossings. 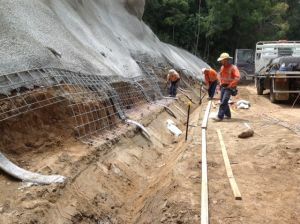 Continue installing soil nails as part of the shotcrete wall construction at several locations along the Goat Track. Installing the upper layer of passive nails on the EPS wall. The project is approx. 41% completed. 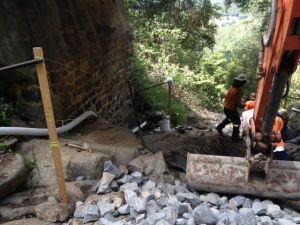 The installation of soil nails, fixing of the reinforcement mesh and the spraying of shotcrete to form the wall on the uphill batter of the Goat Track between Ch 760 to Ch 880. 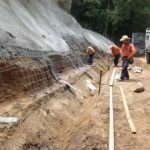 The installation of soil nails for the shotcrete wall between Ch 1080 to Ch 1140. 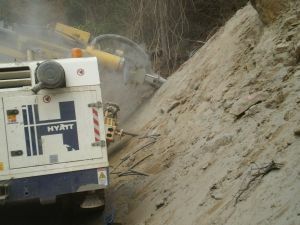 Trimming back by the excavator of the uphill batter slope from Ch 1600 to Ch 1650. 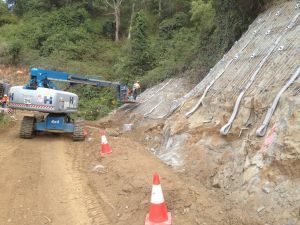 Installation of the passive nails for the Expanded Polystyrene (EPS) wall at Ch 1245. 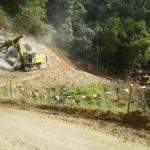 Continue with the installation of the soil nails for the wall structure (# 4) on the uphill batter of the Track between Ch 1080 to Ch 1140. 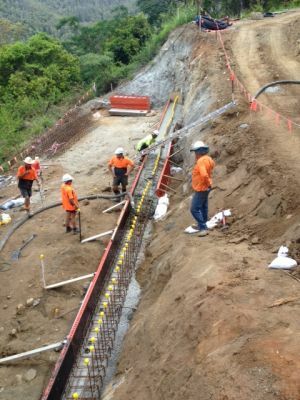 There are 6 soilnails-shotcrete walls required along the 2.7km length of the Goat Track (on the uphill batters). Complete the installation of the upper layer of passive nails on the EPS wall at Ch. 1245. 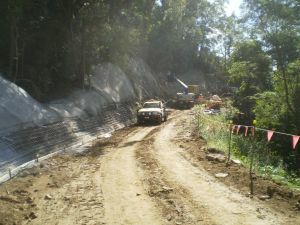 There are two EPS walls required along the Goat Track (on the downhill slopes). The project is approx. 44% completed. 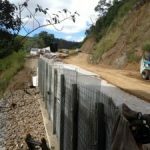 The construction of the Expanded Polystrene (EPS) walls (on the downhill batters) at Ch 1025 to Ch 1045 and at Ch 1240 to Ch 1260 with the installation of the passive nails. The attached photo at Ch 1245 shows a stockpile of EPS blocks in the background. 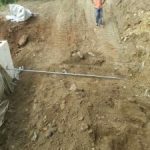 The installation of the stormwater pipe crossings. 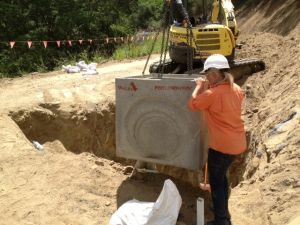 The attached photo shows the inlet being installed. 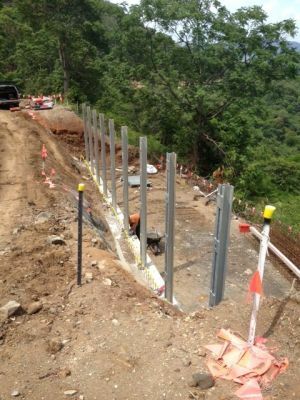 Continuing with construction of the shotcrete walls and the EPS walls. The project is approx. 47% completed. Please note the next update will be provided week ending 7 February. 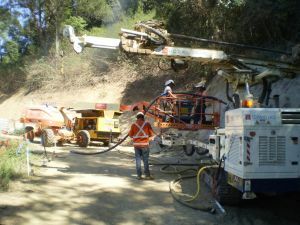 Shotcrete Wall # 2 – Ch 850 to Ch 880: drill and install soil nails . 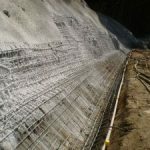 Shotcrete Wall # 4 – Ch 1080 to Ch1140: installation of soilnails. 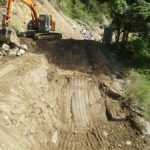 Cut-back batter slope – Ch 1540 to Ch 1620: drill and install nails. 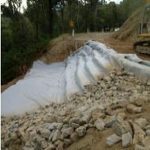 Expanded Polystyrene (EPS) Wall – Ch 1025 to Ch 1045: installing the EPS blocks and backfill to under surface level of road pavement. 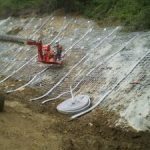 EPS wall – Ch 1240 to Ch 1265: installation of sub-surface drains for the EPS wall. 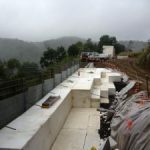 Continue with the construction of the above shotcrete walls and the EPS walls. The project is approx. 53% completed. 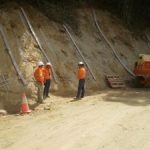 The drilling and installation of the soil nails to form the shotocrete wall # 2 (Ch 850 to Ch 880), shotcrete wall # 4 (Ch 1080 to Ch 1140) and the cut-back batter slope from Ch 1540 to Ch 1620. 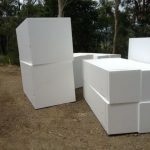 Expanded Polystyrene (EPS) Wall – Ch 1025 to Ch 1045: completed construction of the EPS wall. 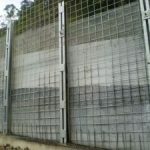 EPS Wall – Ch 1240 to Ch 1265: stood the steel columns on the external face, installed the galvanised mesh which forms the external face wall, placed the EPS blocks and drainage aggregate. Refer attached photos. 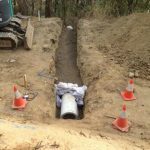 Installation of stormwater pits and pipe crossings. 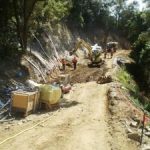 Continue with the construction of the shotcrete walls, soil nail walls and the remaining EPS wall. The project is approx. 56% completed. 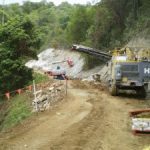 The drilling and installation of the soil nails to form the shotocrete wall # 2 (Ch 850 to Ch 880), the shotcrete wall # 4 (Ch 1080 to Ch 1140) and the cut-back batter slope from Ch 1540 Ch 1620. 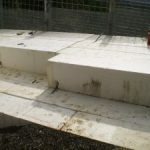 Completed installation of the Expanded Polystyrene (EPS) Wall – Ch 1240 to Ch 1265. 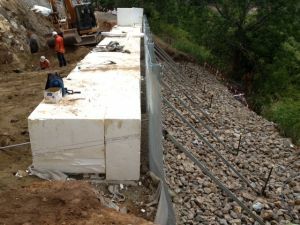 The attached photos show the last of the EPS blocks being positioned and the drainage layer installed. 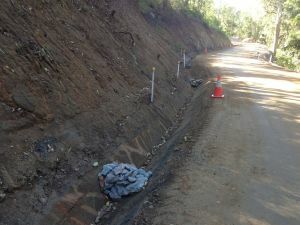 Also, a photo of the construction of the road pavement above the EPS Wall. 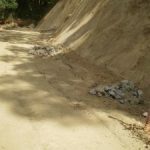 Installation of erosion matting at stormwater outlets. 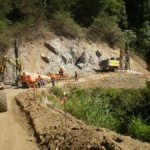 Continue with the construction of the shotcrete walls, and the soil nail walls. 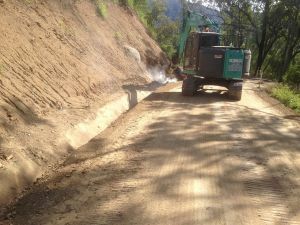 Starting to excavate the side road-drains in areas where the batter slope treatment has been completed. The project is approx. 58% completed. 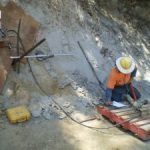 Drilling and installation of soil nails for shotcrete wall # 3 (Ch 1025 to Ch 1070) and shotcrete wall # 4 (Ch 1080 to Ch 1100). 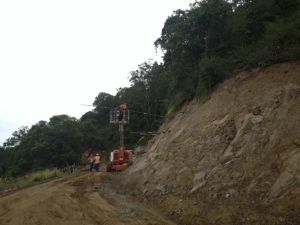 Completed the drilling of the soil nails for the cut-back batter slope from Ch 1540 to Ch 1620. 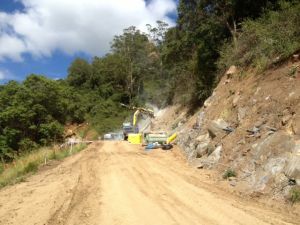 Installation of soil nails for the cut-back batter slope from Ch 1100 to Ch 1140. 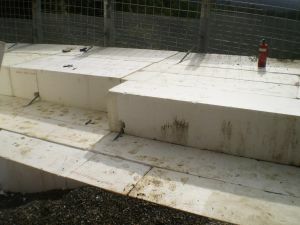 Expanded Polystyrene (EPS) Walls – both walls completed. Minor back filling around the walls was undertaken. 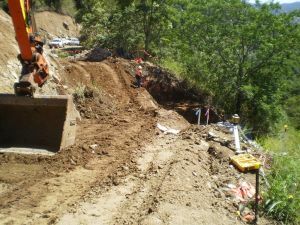 Excavate for the concrete road-side drain at the base of shotcrete wall # 2 (Ch 760 to Ch 880). 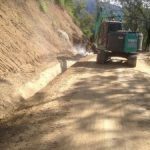 Continue with the construction of the side road-side drains in areas where the batter slope treatment has been completed. The project is approx. 60% completed. 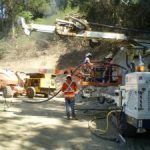 Drilling and installation of soil nails for the shotcrete wall # 3 (Ch 1025 to Ch 1070), the shotcrete wall # 4 (Ch 1080 to Ch 1100) and the shotcrete wall # 5 (Ch 1325 to Ch 1345). 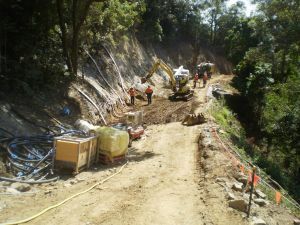 Installation of soil nails for the cut-back batter slope from Ch 1100 to Ch 1140 and grouting the holes of the soil nails previously installed. 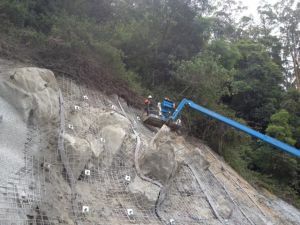 Placing mesh in preparation for shotcreting of the road-side drain at the base of shotcrete wall # 2 (Ch 760 to Ch 880) and continued with the installation of soil nails on batter slope. 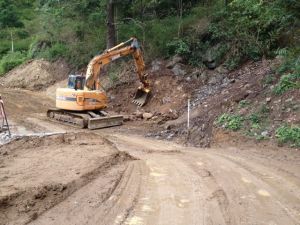 Started excavation for the road culvert at Ch 1325. 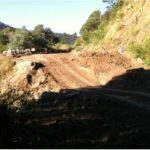 Started sub-grade preparation for the construction of the road pavement from Ch 2560 to Ch 2600. 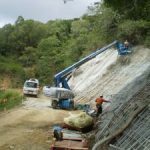 Continue with the construction of shotcrete walls and soil nail walls. 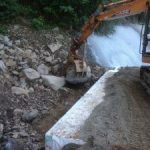 Continue with the construction of the road-side drains in areas where the batter slope treatment has been completed. 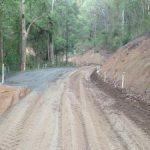 Continue with the construction of the road pavement for the completed sections of the Goat Track working uphill from Ch 2700. The project is approx. 62% completed. 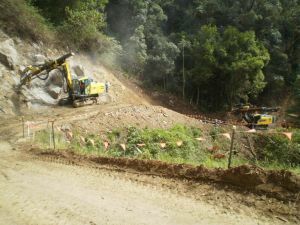 Cut-back the upslope batter to a stable angle – the attached photo shows the excavator forming a bench (working platform) from which it can reach the top of the slope – Ch 1190 to Ch 1260. 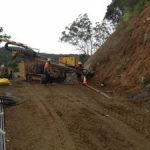 Drilling and installation of soil nails for shotcrete wall # 3 (Ch 1025 to Ch 1070), shotcrete wall # 4 (Ch 1080 to Ch 1100) and shotcrete wall # 5 (Ch 1325 to Ch 1345). 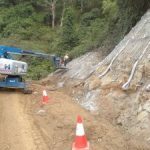 Spraying of shotcrete to form the road-side drain at the base of shotcrete wall # 2 (Ch 760 to Ch 880), sprayed shotcrete to complete another section of this wall, and continued with the installation of the soil nails on batter slope. 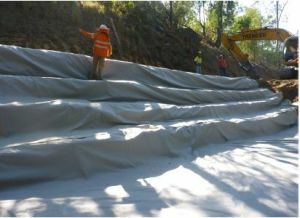 The attached photos show the preparation work prior to the spraying of the shotcrete and the final result. 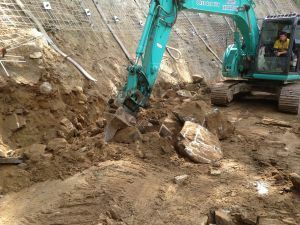 Excavation of rock in order to construct the road box-culvert at Ch 1325. 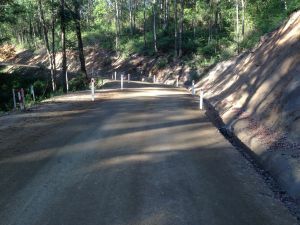 Cut the subgrade level of the road pavement, carried out subgrade treatment and built up the road shoulder from Ch 2400 to Ch 2600 – see attached photo. 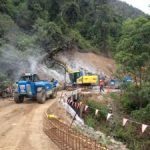 Continue drilling and installing soil nails on Wall 2 (Ch 850 – Ch 880), Wall 3 (Ch 1025 – Ch 1070), Wall 4 (Ch 1080 – Ch 1140), and Wall 5 Ch (1310 – Ch 1380). Constructing the road pavement layers from Ch 2400 to Ch 2600. The project is approx. 64% completed. 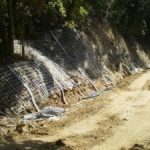 Placement of mesh against the upslope in preparation for the shotcrete spraying of Wall # 2 (Ch 800 to Ch 880), and Wall # 4 (Ch 1080 to Ch 1100) . 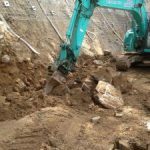 Excavate the V drain against the upslope batter at Wall # 2 (Ch 760 to Ch 880), Wall # 4 (Ch 1080 to Ch 1100), and the V drain from Ch 2500 to Ch 2600. 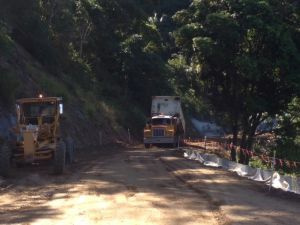 Preparing the subgrade for road pavement from Ch 2300 to Ch 2600 and forming the passing bay at Ch 2330. There are a total of 5 passing bays along the track. 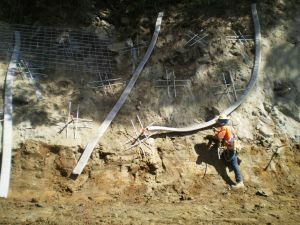 Continue meshing of the upslope on Wall 4 (Ch 1100 to Ch 1140) and forming the V drain at the base of the wall. 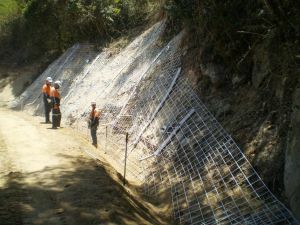 Placing the mesh for Wall # 5 (Ch 1325 to Ch 1345). 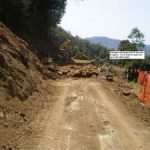 Continue the roadworks from Ch 2000 to Ch 2600. The project is approx. 66% completed. 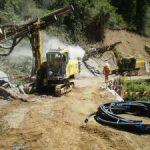 Drilling and installation of soil nails for shotcrete Wall # 3 (Ch 1025 to Ch 1070), and shotcrete Wall # 5 (Ch 1325 to Ch 1345). 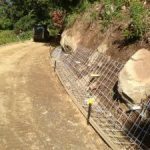 Placement of mesh against the upslope in preparation for shotcrete spraying of Wall # 2 (Ch 800 to Ch 880), and Wall # 4 (Ch 1080 to Ch 1100). 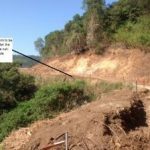 Excavate the V drain against the upslope batter from Ch 880 to Ch 920. 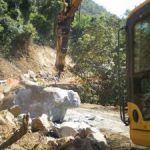 Stabilisation of the rocky outcrop between Ch 380 to Ch 440. 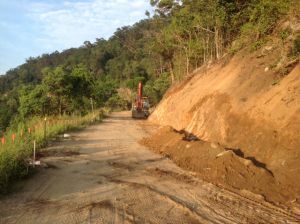 Preparing road alignment at areas where stabilisation of the batter slope has been completed. Refer photo at Ch1325. 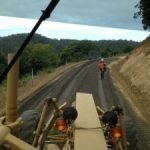 Preparing the subgrade for road pavement from Ch 2000 to Ch 2300. Refer attached photos. 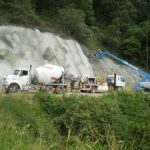 Spray shotcrete to form Wall # 2 (Ch 800 – Ch 880) – delayed due to rain. The project is approx. 68% completed. 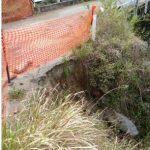 Repaired minor washouts caused by the storms which occurred last weekend (over 200 mm recorded on site). 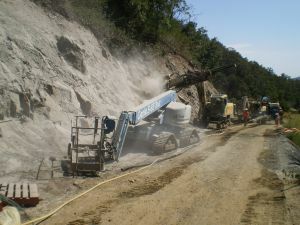 Shotcrete spraying of Wall # 2 (Ch 800 to Ch 820). 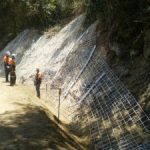 Installation of soil nails and mesh for shotcrete Wall # 3 (Ch 1025 to Ch 1070). 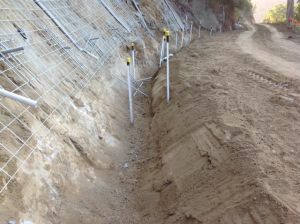 Installed the final soil nails for Wall # 4 (Ch 1080 to Ch 1100). 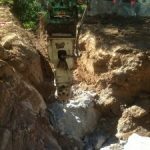 Excavated the V drain against the upslope batter from Ch 880 to Ch 920. 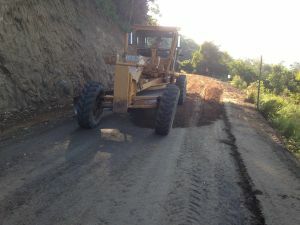 Preparing the subgrade for road pavement from Ch 1800 to Ch 2100. Refer attached photos. 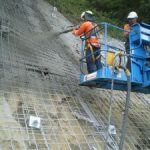 Spray shotcrete to complete Wall # 2 (Ch 820 – Ch 880) – complete the section of wall which was delayed due to rain. Spray shotcrete on Wall # 5. 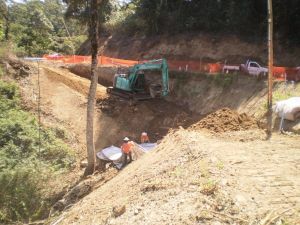 Drilling for the remaining soil nails on the project is due to be completed next week. 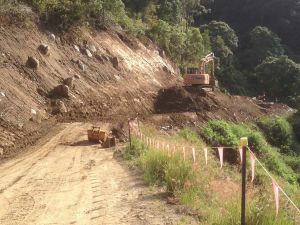 Continue the roadworks from Ch 1800 to Ch 2600. The project is approx. 71 % completed. 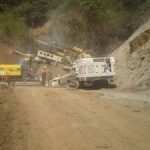 Completed all drilling works and installation of soil nails for the project. Refer attached photo. 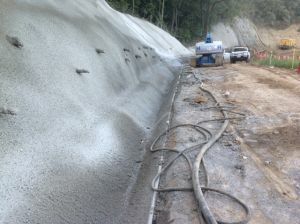 Shotcrete spraying on Wall # 2 (Ch 800 to Ch 880) now completed. 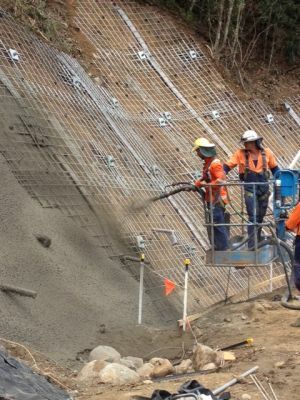 Shotcrete spraying on Wall # 3 (Ch 1025 to Ch 1070) now completed. 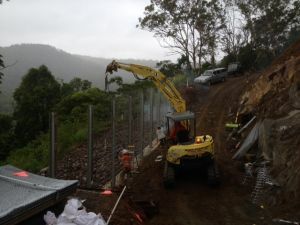 Installed the final soil nails for Wall # 4 (Ch 1080 to Ch 1100) – soil nailing now completed. 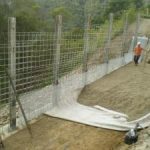 Placement of mesh on Wall # 5 ((Ch 1310 to Ch 1325). 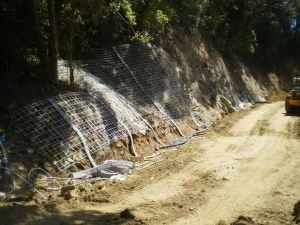 Installation of slope protection below the Macadamia trees. Refer attached photo. 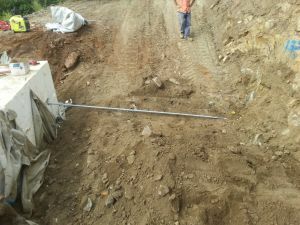 Installation of V drain against the upslope batter adjacent to Wall # 5. 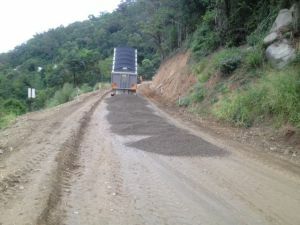 Preparation of road pavement from Ch 1800 to Ch 2100. Refer attached photos. Continue the shotcrete spraying on Wall # 5. Placement of mesh on Wall # 4. 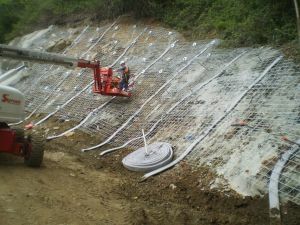 Installation of V drain against the upslope batter adjacent to Wall # 4. 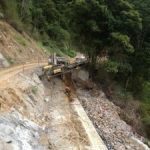 Continue the roadworks from Ch 1700 to Ch 2000. The project is approx. 74 % completed. 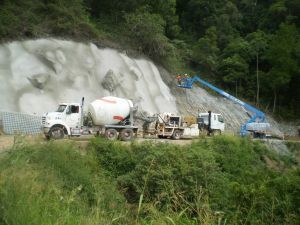 Shotcrete spraying on Wall # 5 ((Ch 1310 to Ch 1325). 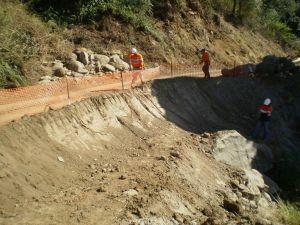 Installation of the V drain against the upslope batter adjacent to Walls 3 & 4. 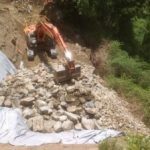 Removal of rocks and stabilisation of the upslope batter walls. Refer attached photo. 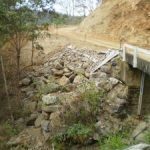 Placement of rock check dams in the roadside V drain. 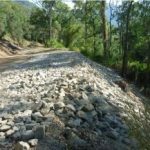 The rock check dams slow the velocity of the stormwater in order to minimises erosion. Refer attached photo. 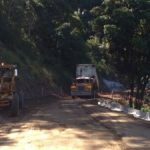 Placement of subgrade material for the road pavement from Ch 1700 to Ch 2000. Refer attached photo. Shotcrete spraying on Wall # 4. 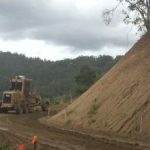 Continue to trim and stabilise the upslope batters. 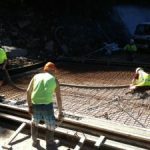 Construct the base slab for the installation of a 3 cell concrete culvert at the location of the old causeway. The project is approx. 76 % completed. 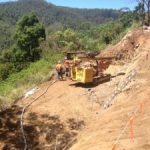 Shotcrete spraying of Wall # 3 (Ch 1010 to Ch 1070) and Wall # 4 (Ch 1080 to Ch 1100): This completes the construction of the shotcrete walls. 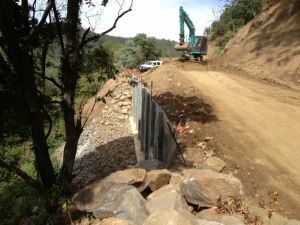 Excavation of roadside V-drains and installation of rock-check dams in the V-drain for erosion control. 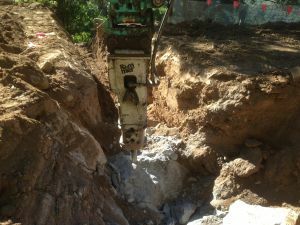 On occasions, a boulder is encountered during the excavation of the V-drain and a rock breaker is used to form the V-drain. See attached photo. 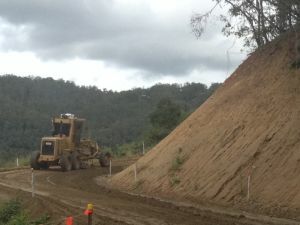 Trimming of upslope batters. 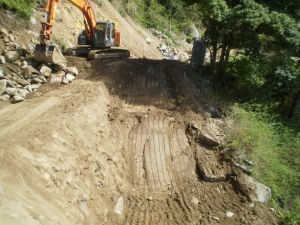 The attached photo shows the removal of an earth platform used by the excavator to trim the top of a high batter slope. 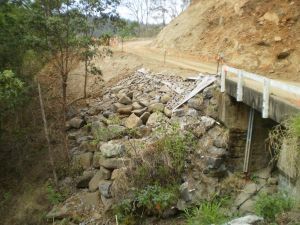 Continue the construction of the 3 cell concrete culvert at the location of the old causeway. The project is approx. 77 % completed. 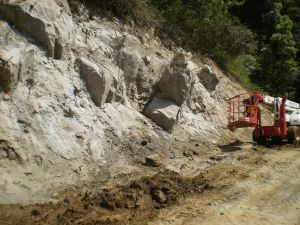 Continued trimming of upslope batters. Removal material from the working platform used by the excavator to reach the top sections of the upslope batters. 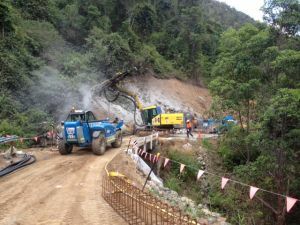 The attached photo shows the excavator removing an earth working platform after the trimming of the upslope batter has been completed. 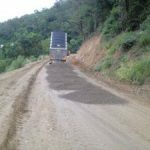 Prepare the road subgrade from Ch 1700 to Ch 2000. 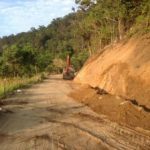 Prepare the road subgrade from Ch 700 to Ch 900. 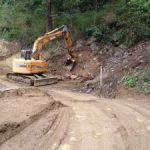 Continue the roadworks from Ch 700 to Ch 900. Prepare and pour the concrete base pad for the 3 cell concrete culvert at the location of the old causeway. 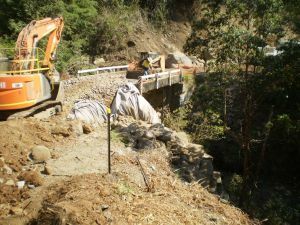 Start repair works on the bridge structure. The project is approx. 80 % completed. Prepared and poured the concrete base pad for the 3 cell concrete culvert at the location of the old causeway. 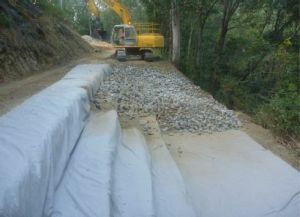 Also commenced the installation of the culvert units. 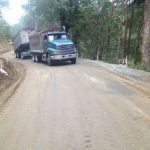 Prepared the road subgrade from Ch 1650 to Ch 2000. 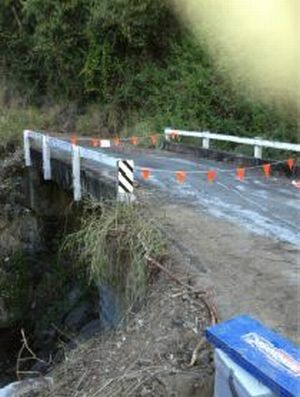 Commenced the repair works on the bridge structure. 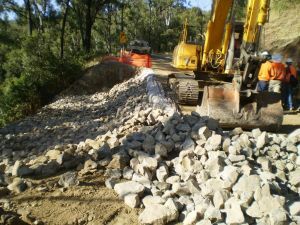 Continued placing rock check barriers in the excavated V drains along the inside road edge. 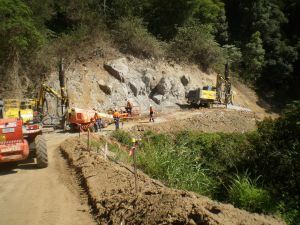 Continue roadworks Ch 1700 to Ch 2000. The project is approximately 83 % completed. 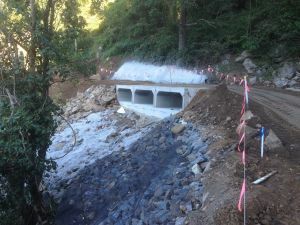 Completed installation of the concrete culvert units. 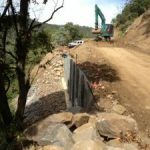 Also backfilled around the culvert and constructed the abutment walls at the stormwater entrance to the culvert crossing. Refer attached photos. 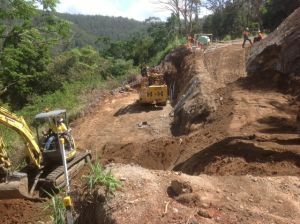 Commenced construction of the driveable drain from Ch 380 to Ch440. 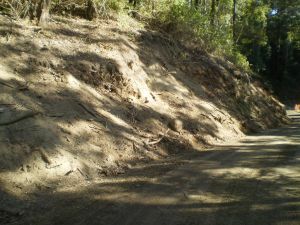 The road width at this section of the Goat Track is narrow due to a rocky outcrop adjacent to the road. 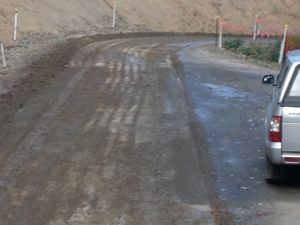 A section of road includes an engineered design drain to carry stormwater as well as forming part of the road pavement. Refer attached photos. 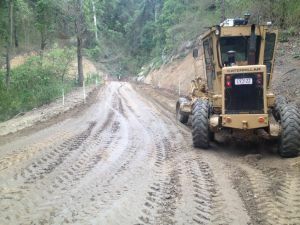 Prepared the road subgrade from Ch 550 to Ch 850. 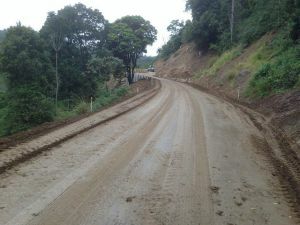 Prepared the road subgrade from Ch 1500 to Ch 2000. Refer attached photos. 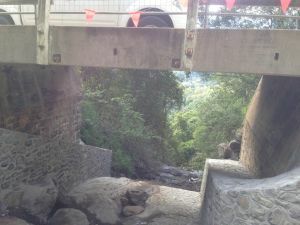 Continued repair works on the bridge structure. Refer attached photos. Continued placement of grassroots erosion control matting at stormwater outlets. 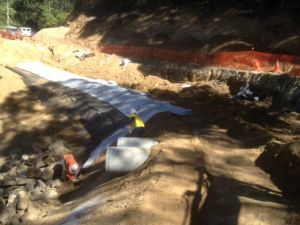 Installation of reno mattress (stormwater protection) at culvert crossing. 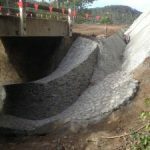 Continue stormwater protection around the bridge abutments. The project is approx. 85% completed. 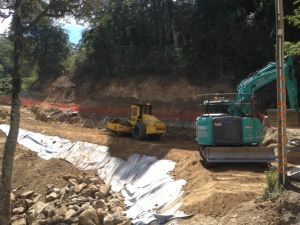 Construction of the stormwater inlet and outlet for the concrete culvert crossing. 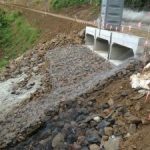 Completed the stormwater protection works for the abutments to the bridge. Refer attached photos. 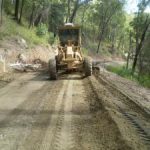 Completed the road subgrade from Ch 600 to Ch 980. 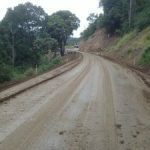 Completed the road subgrade from Ch 1450 to Ch 1700. Refer attached photos. 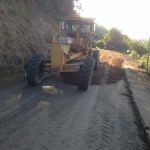 Completed the road pavement surface layer from Ch 1700 to Ch 2000. 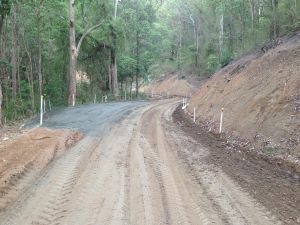 Continued the stabilisation work on the road shoulders. 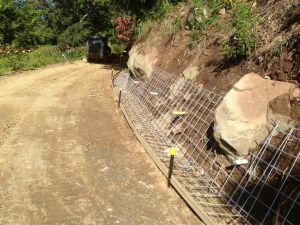 Continued the placement of erosion control matting at stormwater outlets. 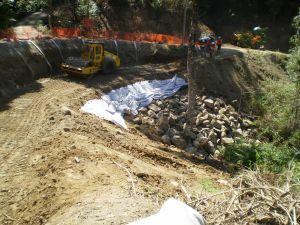 Continue the installation of reno mattress (stormwater protection) at culvert crossing. 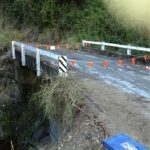 Strip the existing surface of the bridge deck in preparation for the installation of a new deck wearing surface. The project is approx. 88% completed. 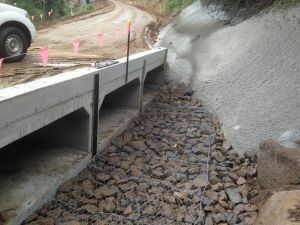 Construction of stormwater inlet and outlet for the concrete culvert crossing – installation of reno mattresses (rock in wire baskets for stormwater protection). Refer to attached photos. Stripped the existing bituminous surface from the bridge deck in preparation for the installation of a new deck wearing surface. 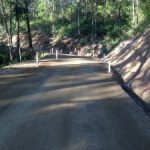 Completed the road subgrade from Ch 1200 to Ch 1450. Refer to attached photo. 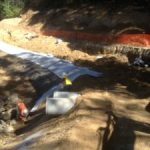 Complete the installation of the reno mattresses (stormwater protection) at culvert crossing. Start the installation of road signage. The project is approx. 91% completed. 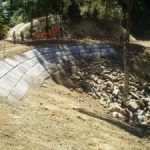 Completed the installation of the reno mattresses (stormwater protection) at culvert crossing. Completed the installation of seal coating on the bridge deck and covered with pavement wearing surface. Refer attached photo. 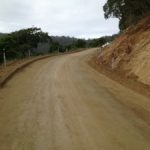 Completed the preparation of the road subgrade from Ch 760 to Ch 1300. Refer to attached photos. Completed the road pavement Ch 1500 to Ch 2700. 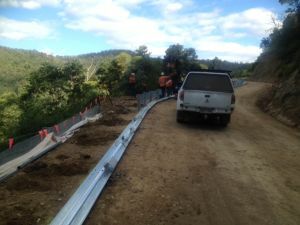 Installation of guide posts once the road pavement has been completed. Refer attached photo. Continue the installation of the road guide posts. 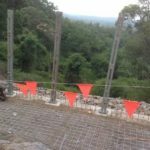 Prepare for the installation of the guard rails along the outside edge of sections of the road. The project is approx. 93% completed. 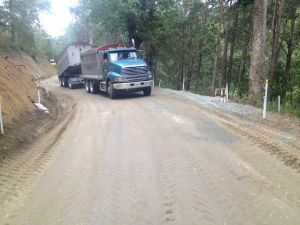 Importing and placing gravel to form the road pavement from Ch 400 to Ch 1,500. 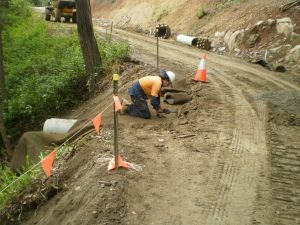 Continued the installation of guide posts once the road pavement was completed. 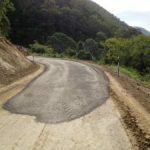 Complete the construction of the road pavement. 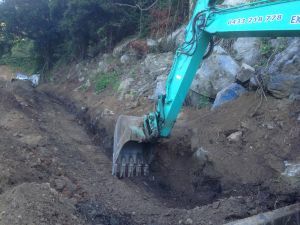 Continue the excavation of the roadside V drains. 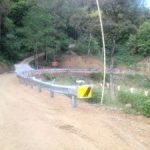 Installation of signs and guard rails along the outside edge of sections of the road. The project is approx. 95% completed. 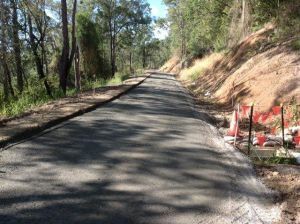 Completed the construction of the road pavement. 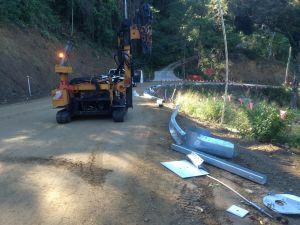 Installed guardrails Ch 180 to Ch 220 and from Ch 1170 to Ch 1260. 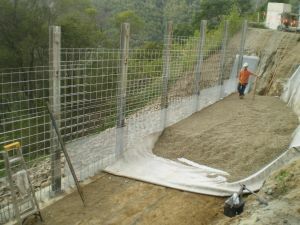 Installed the fence at the Expanded Polystyrene (EPS) walls. 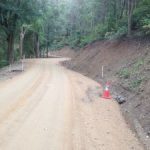 Continued the installation of guide posts and road signage. Complete the roadside V drains. 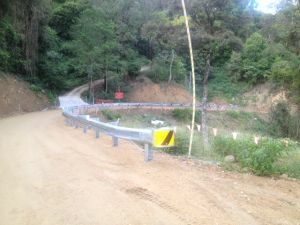 The installation of the remaining signs, guide posts, guardrails, and fencing. The project is approx. 97% completed.